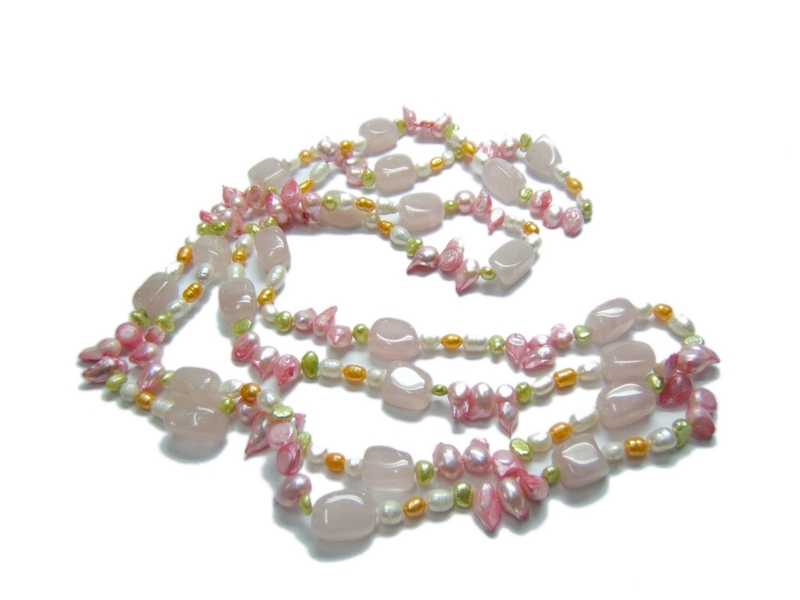 Collar 160 cm cultured pearls and stones rose quartz. Was the necklace a favorite of Coco Chanel. This extraordinary length manages to convey elegance and sensuality. The collar allows you to perform various turns, being habitual use to create triple choker, double princess, or multipulseras. The length is so versatile that it allows make the style tie a knot in the middle recalls the fashion of the legendary the 20. It is easy to find today, on the catwalks of high fashion, garments accompanied by these necklaces to accentuate the extraordinary nature of the collections that are on offer. Traditionally, this necklace was used for evening gowns and gala, giving way in the present to uses the more casual and informal, using pearls are not round, and bringing some freshness to the style of fashion.